Amaranth, a new name to learn! I have to look carefully at the spelling to get it right. Why did I choose to do this grain this week? Well, I was walking the aisles of the Longmont Whole Foods and happened across the Bob’s Red Mill section of grains. Hmm, I needed a new grain for my next post. Amaranth was my choice because of its unusual name. 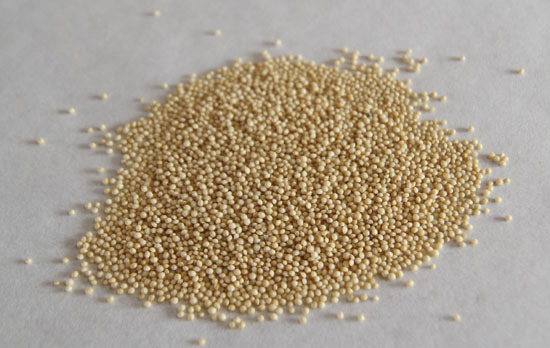 Amaranth is one of the Ancient Grains. 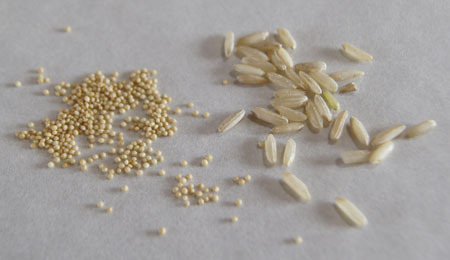 These are grains and pseudocereals that are considered to have been little changed by selective breeding over thousands of years. I think it is fun to try these grains just because they have a long history, and haven’t been selectively bread for ease of growth, processing, and flavor. Amaranth in general refers to a species of plants, the amaranthus. Amaranth is not a wheat, making it a choice for those who cannot tolerate gluten. Many species of amaranth are cultivated, some for the grain called a pseudocereal, some for the leaves to be used as vegetables, and some for ornamental reasons. A lot of amaranth species are not cultivated – they are pesky weeds, called pigweed. And yes, pigweed is common in Colorado. A pseudocereal is the seed of any non-grass grain (amaranth is a leafy plant). The nutrient profile of pseudocerals is similar to that of grass-grain cereals. Just like our familiar wheat products like wheat berries and bulgur, pseudocereals can be cooked in water to make porridge or added to soups, main dishes, sides, and salads, and the dry seeds can be ground into flour. The Oldways Grain Council has a wonderful article on the history and use of amaranth. I learn that amaranth is the traditional grain of Mexico. It probably originated in Peru, and became a major food crop of the Aztecs, domesticated about 8,000 years ago. It was used both for food and for religious ceremonies. When the Christian Spaniards came, they outlawed amaranth because it was used in “pagan ceremonies”. But amaranth is a hardy species, and it survived. Not only did amaranth survive in the New World, it also spread around the world and became an important food source in areas of Africa, India, Nepal, China, Russia, Thailand, and Nigeria. It came to the US markets in the 1970s. In the online article Comeback of an Aztec Food on the Fine Dining Lovers, the authors state “It [amaranth] grows fast – more quickly than corn – in high temperatures and is able to withstand drought, with a very high yield: one plant can produce 200,000 seeds”. This same website has a great photo of amaranth growing in a field. The package gives directions for popping the seeds, which then can be used directly in sweet-type recipes. Well, I wasn’t successful! I put a tablespoon in a large pan over medium high heat and stirred. They did start popping, but I tried to get every single one popped, and they turned fairly dark brown, and tasted terrible and gritty. And the rolly pollies spread all over my cooktop. The next morning, I heard a strange hissing/popping sound after my husband finished cooking his eggs. I went into the kitchen and found amaranth seeds trying to pop under the hot pan. These little seeds are really hard to clean up! The package said to cook 1 cup amaranth in 3 cups water for 20 minutes, but I found it took at least 30 minutes before it was soft and all of the water was taken up. The photo below is cooked amaranth. The cooked grains/seeds are semi-reflective. I note from one site that you should rinse the cooked amaranth with water before serving or adding to recipes. That might make it have a more pleasing texture. But, you’d have to use a pretty fine sieve to rinse it. Amaranth can also be toasted in a dry pan and then used in sweets. But, I was not successful (discussed above), so I suggest researching other online sites for directions. The bit that I did get toasted tasted yucky to me, so I am not going to pursue this. I did not really like the taste of amaranth cooked as a porridge. We all have our own tastes! To me, it was almost bitter. I stirred some sugar into my porridge and it was a lot better! But that defeats my slow-carb goals. Plus the texture was a little sticky and mushy. 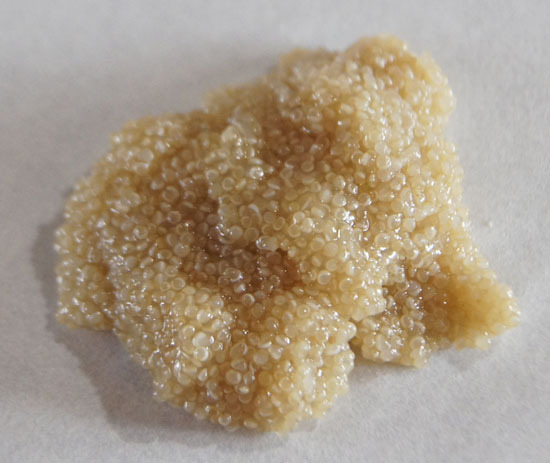 If I was gluten-intolerant, I would pursue recipes that use amaranth flour instead. I have not totally given up on amaranth, since I have most of a bag of it left. I might try some of the recipes in the links below. They suggest using amaranth in puddings, as a substitute for polenta, in tabbouleh-style salads (after cooking and rinsing), or mixed with yogurt and granola (after toasting).